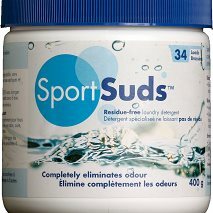 We have been using Sports Suds in our house for several years now and love the fact that it eliminates the sweat, stains and odors from training and racing and all in an environmentally friendly product. Sports Suds is a Vegan product so no animal testing during the production process. We have a Promo Code “HAMPTON”. It provides a 20% off all products on our website (www.sportsuds.com). Sports Suds have been sponsoring our Hampton Ladies Triathlon for the last 3 years and we grateful for their support with this wonderful product. At Sport Suds, we demand environmental responsibility and formulations that are gentle for everyday use. We accept nothing less than exceptional performance.